Catherine Van de Heyning is lawyer and specialises in Economic Criminal Law. She graduated as a Master of Laws from Antwerp University in 2006 and went on to obtain an LLM degree at University College London. In 2011 she was awarded the title of Doctor of Law for her thesis “Fundamental rights lost in complexity? 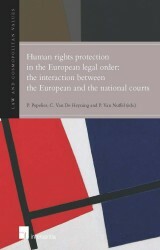 The multilevel protection of human rights in the European legal space”. She worked as a human rights researcher at Antwerp University and lectured at the University of Leiden before being admitted to the Bar in 2012. Catherine Van de Heyning is also a member of the Bar of Antwerp.